The anti-immigrant and antigovernment biker crew Riders United for a Sovereign America (Riders USA) may have thought they'd found a fellow traveler when a college professor agreed to speak to their group on Monday night in Arizona. 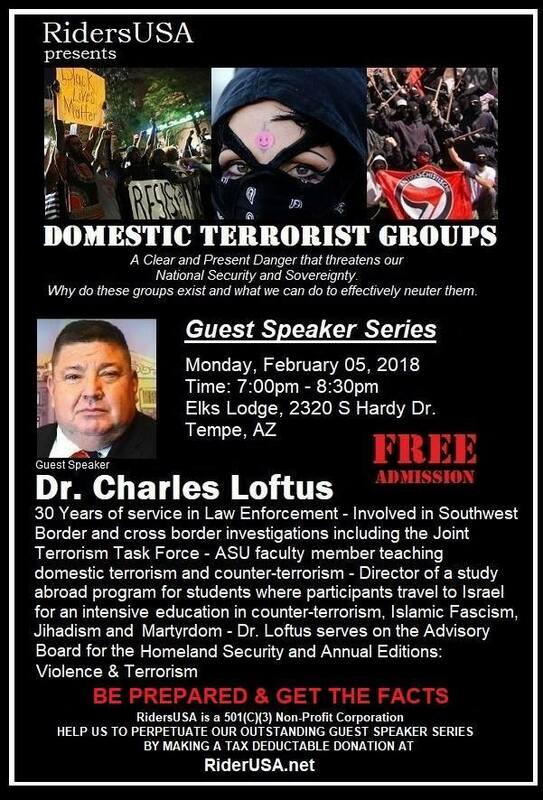 They’ve spent weeks hyping the February 5 lecture by Charles Loftus of Arizona State University as nothing less than a how-to guide for fighting Black Lives Matter and anti-racist activists – depicted as “domestic terrorists” and the “enemy" in their social media postings about the event. A description of the event that accompanies the ad praises Loftus as the man to lead the way. But the group may not end up getting quite what it hoped. Loftus, a retired cop who teaches courses on international and domestic terrorism at the university’s School of Criminology and Criminal Justice, told the Southern Poverty Law Center on Friday that Riders USA created the ads on its own and that he has no intention of joining their cause or coaching them on how to combat other groups. He went further to say that attendees of the event probably won’t like what he has to say on a number of topics, and that he’s prepared to do “verbal judo” with them. Loftus spent 30 years in law enforcement, including 12 with the Arizona Attorney General’s Office, where he was part of the Joint Terrorism Task Force. During his work in the 90s, he said, the so-called patriot and antigovernment movement was very much on his radar, particularly after the Oklahoma City bombing. But his career in policing came to an inglorious end last year when he was fired from the law enforcement arm of Arizona’s welfare agency, the Department of Economic Security. Reports had surfaced that his police force had been amassing guns and ammunition — reports which he said were overblown, particularly considering the size of the agency. He and his former boss, who was also fired, have since filed a libel lawsuit against the state. Loftus said he wasn’t familiar with Riders USA when he initially met several members a few months ago. He’d heard there may be an Antifa (anti-fascist) demonstration in Phoenix and went out to photograph it, hoping to use the photos for a future class on protests. When he got there the Antifa event didn’t exist. There were, however a handful of would-be counter-protestors from Riders USA. He may not have known quite how radical, however. Riders USA has been one of the most vocal anti-immigrant groups in Arizona for the past decade. It was founded by nativist Rusty Childress, although his activity appears to have ebbed in recent years. At one time, Childress was friendly with neo-Nazi JT Ready, who in 2014 killed himself and four other people in a house in the Phoenix suburbs. (Loftus said he wasn’t familiar with the Ready massacre and that the state’s Joint Terrorism Task Force, which he was part of when he worked for the state attorney general, probably should have looked into Ready’s activities.) The Southern Poverty Law Center has listed Riders USA as an extremist antigovernment group for years. On its website, Riders USA pushes conspiracy theories about the “new world order” and the “North American Union.” It also advocates ending birthright citizenship, as granted in the 14th Amendment. No one from the group returned messages seeking comment in recent days. A number of people have already told Riders USA on its Facebook page that they plan to attend Monday’s event. Among them is Buffalo Rick Galeener, who pleaded guilty in 2008 to a misdemeanor count of public urination during an anti-immigration protest near a day labor center in Phoenix. Leaders of other anti-immigrant groups, including Patriot Movement AZ, who were recently heard yelling things like “go back home” and “illegal” at Hispanic staffers and at least one Native American lawmaker at the state capitol, have also indicated they plan to attend Loftus’s lecture. For the last point, he said, that one was easy.